On January 3rd the government was expected to announce the new economic measures for 2015. During that day we received a bunch of messages regarding the manner in which the government would inform the public. First, Maduro was going to drop the bomb all by himself. Later, we were told there were going to be two announcements: a technical one by the relevant authorities, and another one “for the people” by the President. By the end of the day, we heard they were going to hold one of their televised “work” sessions to deliver the news. Nothing happened. Next thing we know, Maduro jumps in a Cuban plane, and goes on a trip to Russia, China, and the middle east, to find something, or somebody, or time, or whatever. It is clear that there is a huge disagreement with respect to what has to be done. Word in the street is that most of the high ranking chavistas agree that the measures have to be put in place asap, and that Maduro used whatever leverage he has left to buy him time, sort of to deliver some good news with the bad news. A Hail Mary. Russia: Maduro’s quick stop by Russia was prolific in generating memes of the President wearing a huge Bolivarian scarf as he stepped off the plane. Putin didn’t receive him. China: Maduro announced that the Chinese government was to invest 20 billion in Venezuela. The Chinese government announced “meh“. In the end, they mostly spoke about existing agreements, and Maduro even admitted he wasn’t sure the Chinese “investment” would help Venezuela survive these low oil prices. Iran: The Venezuelan government deemed the trip a success as they proudly announced the result: The Teheran – Caracas direct flight will be back. 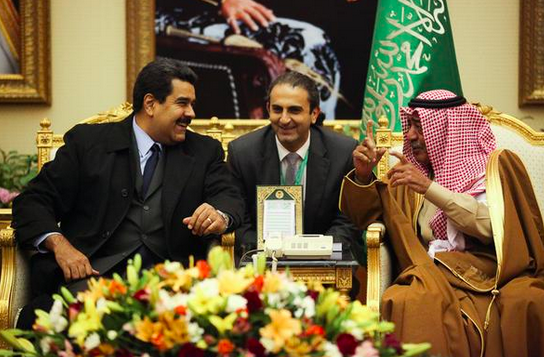 OPEP Countries: Maduro has been meeting with middle eastern princes, sheiks, and the like, who have briefly received him politely for some awesome photo ops. Also, the Maduro family vacation album leaked. Venezuela is going through an incredible tense moment. It is very hard to believe that these pictures were just posted on any of the Maduro sisters Instagram or Facebook accounts. Can they be this stupid? They are smiling for frack’s sake! One can only think there may be some evil chavista mind trick behind the leak. Or, again, they are just really really stupid. As Juan says in his post “Caracas Chronicles has been loathe to delve into the whole Derwick-Diosdado-opposition saga” and, in the mean time, we won’t get into that. We understand, however, that most of our readers ache for a dose of boligossip every once in a while. In this respect, Thor Halvorssen’s letter is well worth another read. This is a sidefight that deserves attention. We covered the whole “Venezuela ran out of McDonald’s french fries” issue, mostly based on Hannah’s article and Dante’s twitter frenzy (you know, Dante Rivas, Venezuela’s own antibureaucracy czar). The McDonald’s thing should not be THAT relevant since we’ve got people standing in line for hours just to get a hold of chicken and milk whatever they can find at the supermarket. What did make it relevant for us was Dante’s comments: “McDonald’s ran out of French fries. Pretty cool. We welcome the turbulence. Now we shall eat yuca 100% Venezuelan made”. The guy is evil. The whole Twitter rant is absolutely incendiary, and makes you think that there is an ulterior motive to saying crap like “Whoever wants to eat imported food, go right ahead, but with your own dollars and not with the country’s dollars.” Then you see the pictures of Maduro’s sisters touring the countries of the Axis, and you are sure there is an ulterior motive to those comments. Someone is trolling us. Dante’s tweet says: “Here I’m sending you the instructions for Registrars and Notaries, so you can defend yourself from mistreatment.” Attached to the tweet he included the letter instructing Registries and Notaries to simplify the requirements and revision of the documents they process, including an explicit prohibition to request copies of identity cards and tax information certificates to signatories. If you are not Venezuelan you may not understand this. But copies of personal documentation is the root of all evil in our country. The man is embarking in an epic quest. Look over there, Sancho Panza, my friend, where there are thirty or more monstrous giants with whom I plan to do battle and take all their lives, and with their spoils we’ll start to get rich. This is righteous warfare, and it’s a great service to God to rid the earth of such a wicked seed. It’s like he is a mini-Chávez. Dante vive. Our Minister of Justice, @gestionperfecta (gotta love her avatar), and Carlos Osorio, Vice-President of Alimentary Security and Sovereignty (? 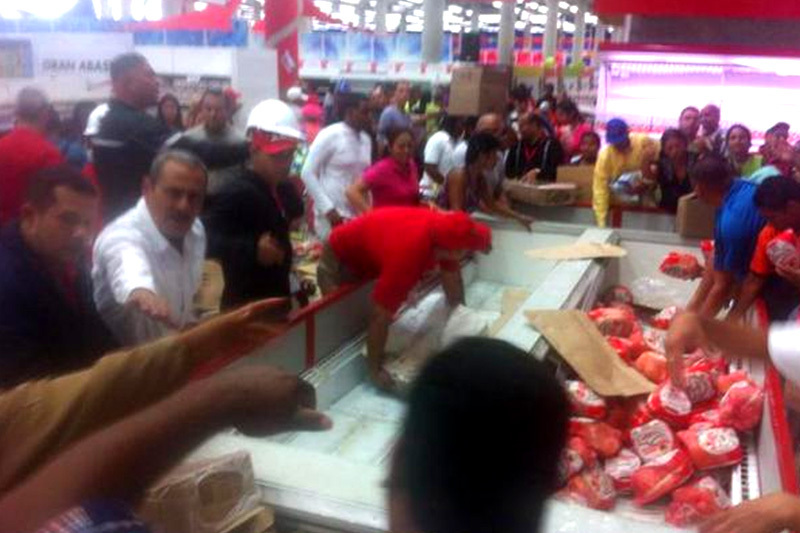 ), went on a planned PR visit to the Bicentenario Supermarket in Plaza Venezuela. Planning and executing are two very different things. Reality exploded on Osorio’s face as the chicken arrived and the mob went haywire. The good people at VivoPlay have been doing an excellent job covering this new wave of scarcity in Caracas, but in more than one occasion have been forced to turn their cameras off. Moreover, the general coverage of the situation has become a serious issue. At least two journalists have been aprehended and taken to Fuerte Tiuna for taking pictures of the lines outside the supermarkets. Check out Rodrigo’s first hand account of crime and violence in the streets of Caracas. A nice piece of literary journalism. Zulimilk’s powdered milk production plant was subject to “intervention” by the government. There seems to be a pattern in Central Government’s idiocratic strategies and statements while Maduro is away. Just like the call for a national strike which doesn’t even deserve a bullet of its own (ok, maybe just a quick link). They seem to be looking —once again— to generate a crisis. And who can blame them? Chavismo thrives in conflict. With all the silly mishaps Nicolas Maduro has been dealing with since the new year we forgot about other (most boring) subjects. For instance, the recent Tax reform that was put in place per the Enabling Act. As many other scandalous changes that were swept under the rug, the reform modified the concept of taxable net income in article 31 of the Income Tax Law. We won’t get technical, nor will we get deep in the legal discussion of whether the old concept still applies. The only thing we are going to say is that this issue is likely to get a lot of press in the days that will follow. This modification, along with the severe penalties that were included in the Tax Reform, will force the Employer (companies) to withhold taxes over some concepts that were considered non taxable for employees. This is serious. 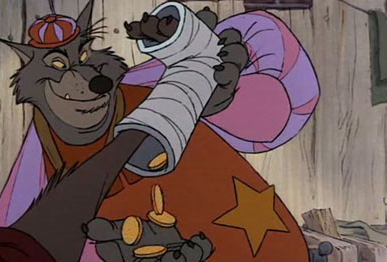 While people stand in line trying to get products that are scarce, the government slides its hand into their pockets to get hold of a poor, devalued coin. Miserable. On the other hand, we have the parallel Dollar almost reaching Bs. 188. As expected. There is, however, an unexpected new variable to this equation, the SICAD II rate just pierced through the Bs. 52 ceiling.